The boss of the UK's biggest protective packaging distributor has a "high degree of confidence" it could still serve customers after a no-deal Brexit. Peter Atkinson of Macfarlane Group said there would be difficulties if Britain crashed out of the EU, but added that contingency plans were in place. His comments came as the Glasgow-based firm reported a ninth year of successive growth. Sales were £217m in in 2018, up from £196m the year before. And profits before tax and one-off costs were at £11.2m - 20% ahead of 2017. UK Prime Minister Theresa May is trying to finalise Brexit arrangement with EU leaders in Brussels ahead of the planned departure date next month - but a final deal has yet to be done. Mr Atkinson told the BBC's Good Morning Scotland programme: "We're relatively fortunate in that the majority of the products we source come from UK suppliers - only 10% of what we buy comes from outside the UK. Asked about a no-deal Brexit, he added: "There's going to be some difficulties for sure, but all the planning and preparation we've done to date gives us a high degree of confidence that we can continue to serve our customers effectively." Macfarlane Group was started 70 years ago by Norman Macfarlane - now Lord Macfarlane - who began selling stationary from a one-room office in the centre of Glasgow. Mr Atkinson said of the company as it is now: "Internet retailing has been a big part of our growth story. "It now represents about 20% of our revenue. A whole range of customers from Burberry to people like (cosmetics retailer) Feel Unique." Mr Atkinson also said Macfarlane Group was playing its part in cutting packaging waste at a time when companies are under pressure to do the same. "We're a distributor, we don't have factories to support us. We can choose the right products that support customer requirements. Part of what we do is provide advice to our customers. "The majority of the corrugate we buy comes from recycled paper and a high proportion of the plastics we buy come from recycled commodities as well." 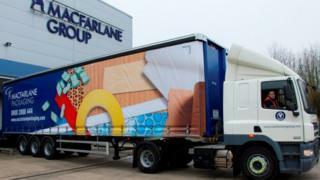 Mr Atkinson added that Macfarlane Group was poised to announce a series of ventures this year to support its customers who want to expand in Europe.